Club Penguin Cheats by Mimo777 Club Penguin Cheats by Mimo777: Director "Highly Dangerous Mission" Message! 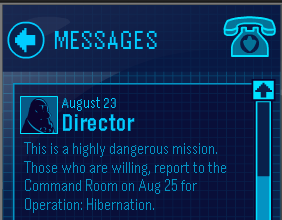 The Director has sent us a Club Penguin message yet again! I don't. If it is I am going to be very upset! I think Its gonna be a mission... Thumbs up or comment if willing to be a mission!!! i'll have my fingers crossed!!! The great snow race is just a cover up for opperation:hibernation. I think Klutzy is helping us. He seems very unhappy lately, did you see his sad face in the new System defender level? and a crab was sneaking away during the interview with G.